Following the discussions both elsewhere and on this blog about sprint duration, the questions poses itself - what is the preferred sprint length? So I ran a poll. And the winner is... 2 weeks. 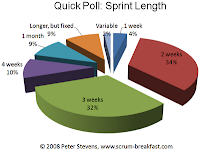 According to this very scientific survey (1 week on my blog, 228 Visitors, 50 votes), the most popular sprint duration is 2 weeks, followed by (early leader) 3 weeks, which lost by one vote. Very short sprints, i.e. 1 week are appropriate for very short projects, say 1 month. To do a 4 week project in 1 sprint, or even 2, does not leave much opportunity for feedback. Thanks to Dmitry, Ben, Ash, Ilja, Paul, Kiran, Paddy, and Brett for their comments, as well as to everyone who voted! I note some teams have a variable sprint duration. Is this a "Scrum smell" or is there any merit in it? It's considered to be a smell. According to Jeff Sutherland's latest Scrum-But test, an iteration length of 4 weeks or less is good. If the sprint length is longer or variable, this has been found to be a sign of lower performance. Results: How agile are you? Quick Poll: How long to sprint?